Coming out of spring practice, Nebraska quarterback Tommy Armstrong has established himself as the clear-cut starter for 2014. It certainly wasn’t on the performance at the spring game, where he went 4-of-8 for 97 yards and an interception. But based on all reports, at the conclusion of spring practice, Armstrong was pretty well-ensconced as Nebraska’s starting quarterback next year. So if Armstrong is to lead Nebraska to greater glories, what must he accomplish? Let’s do a thought experiment. Here are the blind statistics of two quarterbacks. Take a look, and think about what conclusions you can draw. In comparing the two, it’s pretty clear that while neither signal-caller would be confused with Peyton Manning, Quarterback B had a fairly decided advantage in terms of general accuracy, scoring and avoiding turnovers. Quarterback A is, of course, Armstrong’s stat line from 2013. Quarterback B? That would be for Taylor Martinez in his freshman year of 2010. Yes, that Martinez, the one who wowed us all with his legs but terrified us with his mechanically awkward throwing motion and predilection for incompletions and interceptions. That Martinez is the one who looks statistically superior to Armstrong’s production in 2013. Now, in many ways, the comparisons aren’t really fair. Martinez won the starting job in fall camp, where Armstrong was pressed into service midway through the season due to injury. Martinez in 2010 had a defense that was much more reliable than Armstrong did in 2013. And Martinez was so dangerous with his legs that the passing game was far more open than it was—or will be—for Armstrong. But the numbers don’t lie, regardless of what Mark Twain said. If Armstrong is to be successful as Nebraska’s quarterback, those numbers simply have to get better. It may very well be unfair to ask Armstrong to make a quantum leap in his passing stats from 2013 to 2014. But given what Nebraska has on offense, the onus likely will not be on Armstrong to be successful. 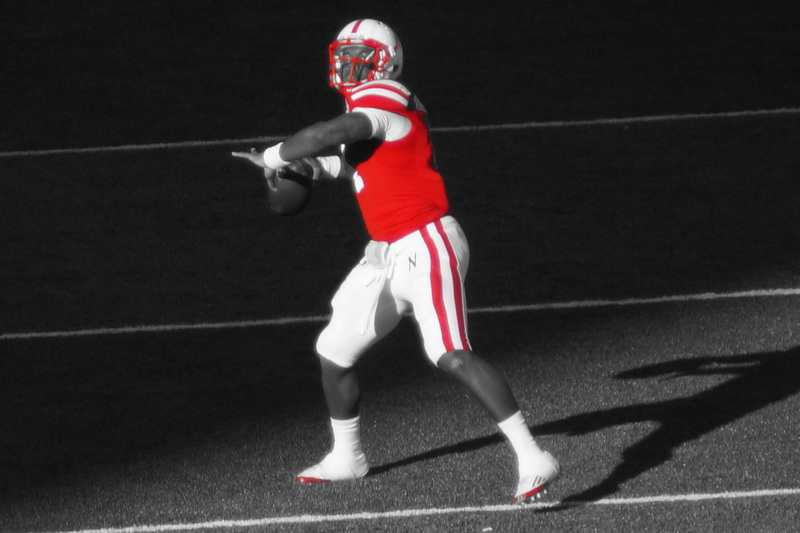 Nebraska’s best weapon on offense, pretty clearly, will be I-back Ameer Abdullah. Behind Abdullah are a number of talented backs, including Imani Cross and Terrell Newby who both demonstrated unexpected flexibility in the spring game. Nebraska’s receiving corps, led by Kenny Bell and including Jamal Turner and Jordan Westerkamp, may be the deepest and most talented in the school’s history. Of course, what Armstrong does under center will be critically important. But it doesn’t look like Nebraska will need to lean on Armstrong to be the driving offensive force. Instead, Nebraska will need Armstrong to perform in a role similar to Russell Wilson for the Super Bowl champion Seattle Seahawks—provide leadership, make plays and move the chains when needed and protect the football. Yes, I understand this argument is circular—the thing Armstrong needs to do in order to win is to win. But at a certain level, that’s the nature of the job. In his freshman year, Armstrong was dazzling at times and cringe-worthy at other times. But ultimately, Armstrong is 7-1 as a starter. That kind of momentum and production is part of the reason he has been able to establish himself as a leader in the huddle and on the field. Football is, ultimately, a funny game with an odd-shaped ball that takes weird bounces. Throughout the course of the 2014 season, Armstrong will be presented with unpredictable obstacles to overcome. If he is able to figure out a way to guide Nebraska through those obstacles and keep winning, he will be able to keep the momentum going he has generated already and allow his success to beget further success.